Every surface needs to be prepared before it’s (spray) painted. 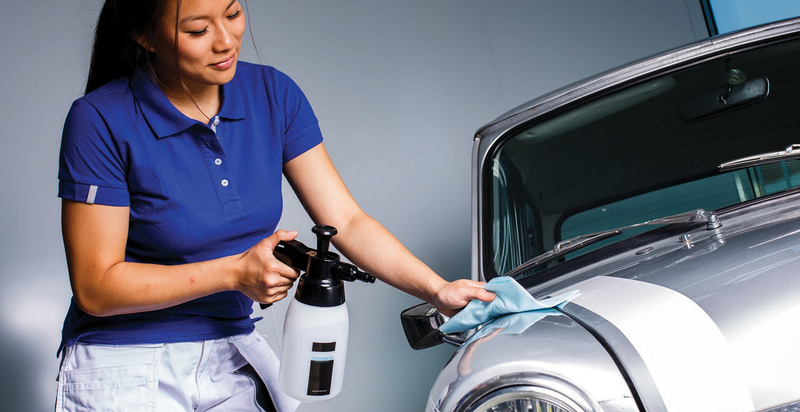 A dirt and dust free surface is an absolute necessity before starting your car paint job. The less your body comes in contact with dust and paint, the better it is for your health. Most importantly, it prevents small dirt and dust particles from contaminating your fresh spray paint job. To guarantee the best results, proper preparation is needed during the whole paint process for an immaculate finish. Paint defects, every car painter knows the problem of dust. It is often inexplicable and sudden present. The moment and place of dust fall are usually very unfavorable. Often in the last layer and usually in the middle of the roof or bonnet! Direct repair is often impossible while the only solution is to let the object dry, to sand and polish out the pollution, or worse, re-do the panel. Advisable is to use the tips below to get the most out of your surface preparation job. Make sure your object is masked properly. Key to a good masking job is attention and quality masking products as masking tape and masking paper. Work clean and use the stated high quality products to prevent re-do’s. We advise using the following masking tips. It might be needless to say, but before starting any job, please take care of your personal safety by picking the correct Personal Protective Equipment (PPE). Proper PPE not only protects you, but also prevents contamination of the painted surface by hairs, fibers and lint. Keep your PPE gear clean and do not enter the spray area when not necessary to maintain the best results. As a spray painter, dust is always inconvenient and always present. Partly due to a correct order in the process, dust is nonetheless to limit or prevent. 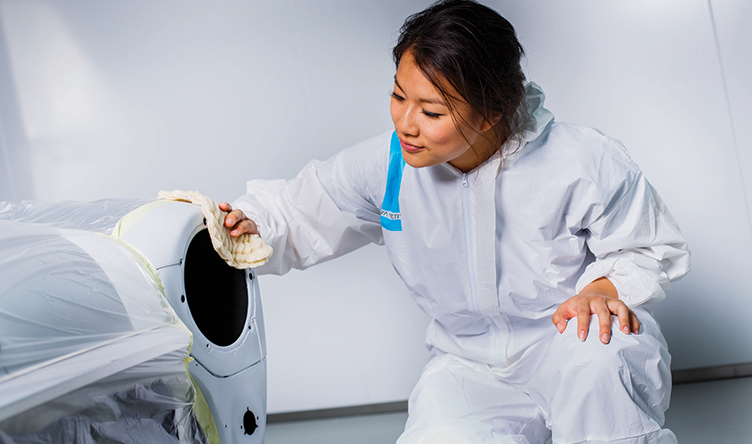 In order to start a paint job properly, the object must first be cleaned properly, even before masking. The best way is to wash the surface and then spray with water. A high-pressure cleaner is ideal for this job. This allows all seams and cracks to be well-ejected. If this is done correctly, a considerable amount of dust has already been removed. Obviously, a lot of dust will be released during the course of the project. Every operation that is performed causes dust to a greater or lesser degree. In order to be able to properly remove this dust, blow-off pistols can be used. Make sure that the used compressed air is free of water, oil and dust. For this, it is best to have a compressed air supply unit installed at the extraction point of the compressed air. These large, textured cotton cloths with dust holding capacity collect and remove loose contamination such as dust, dirt, hair and lint from surfaces. The textured construction and tacky coating pick up all particles and hold them firmly inside the open structure. The use of tack cloths is ideal for large surface areas when removing high levels of dust contamination. Minimal pressure should be applied and simply wipe the surface lightly, until every dust particle is absorbed by the cloth, leaving the surface free of dust. The Tander Tack Cloths can be used with both water- and solvent-based coating systems. They do not harden and are lint-free to achieve an accumulate finish. Another tool to make objects dust-free are degreasing cloths. These alternatives for paper towels are produced out of strong material to minimize the loss of fibers. They are super absorbent and do not leave adhesive marks. With these cloths you can easily reach corners and edges that are difficult to access. Ideal to reach all small spaces where dust gathers. The cloths are ideal for usage with water and/or solvent based degreasers. Use the Tander Degreasing Cloths in combination with the Pump Sprayer for the best results! Tander Prepare products help you pick up all dust particles and guarantee you a spotless surface. Make sure your surface is spotless and paint-proof before letting your creativity run free!